Activate! An exciting and intensive exam preparation course tailored to meet the needs of your teenage students. Activate! A2, B1, B1+ and B2 is an exciting and intensive four-level exam preparation course tailored to meet the needs of your teenage students. Focusing on themes from teen culture brought to life with the inspiring video on the Active Book which is a digital interactive version of the Students' Book. Activate! offers an enjoyable and highly motivating exam preparation experience for a range of international exams. Activate! is also ideal preparation for KET for Schools, PET for Schools and the upcoming FCE for Schools. 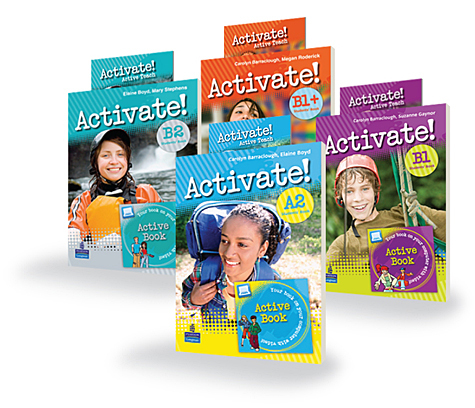 “Activate! does exactly that it activates the language of the pupils in a teenage environment. It's colourful, and interesting and our pupils love using it. With Activate! English is a lot more than a language!" 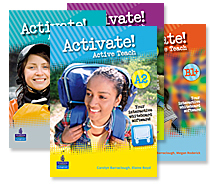 Active Teach is software for an Interactive Whiteboard or a computer and projector. Load it to your computer to have all your teaching resources in one place…saves time in class and makes preparation quicker! Help students take control of the reading experience. 5 levels that help students take control of the reading experience. Teen exams course Activate! 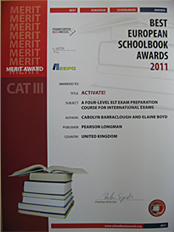 has won a merit award in the Best European Schoolbook Awards (BESA)*.